You don’t have to travel very far from home to discover someone with a different “worldview” than yours. While traveling in Asia, I learned quickly that we all “see” life differently. As cities in the United States become increasingly global, your chances of being surrounded by those who share your worldview becomes increasingly slim. And that’s not necessarily a bad thing. So, what is a worldview? Apologist Norman Geisler says you can think of your worldview like a pair of lenses through which you view and interpret life. 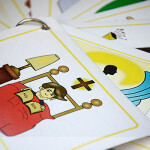 * Your past experiences, cultural values, and personal beliefs all form your worldview. Just like a regular pair of glasses, our cultural lenses impact what we “see” and how we see it. That means when we open the Scriptures, we read it with a certain perspective – a pair of lenses – based on our worldview. Our worldview impacts the way we “see” Scripture – the way we read, interpret, and apply it to our lives. And here’s the important part: very often, our lenses don’t line up with reality. If I’m wearing a pair of colored lenses, they will color or tint everything I see, and that may or may not actually represent the truth. Have you ever been driving down the road and had your breath taken away by the colors of a sunset, only to realize that you had polarizing lenses on? The tint of your lenses colored what you saw. Spiritually speaking, we need to check our eyesight to ensure the way we’re viewing Scripture aligns with what’s really there. Because in our culture today, there are some common lenses we wear to read God’s Word. And increasingly, our worldviews – right here in America – are becoming devoid of God. 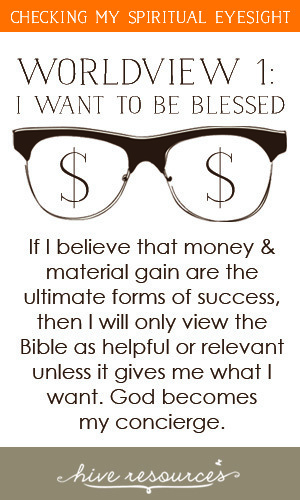 If I believe that money and material gain are the ultimate forms of success, then I will only view the Bible as helpful or relevant unless it gives me what I want. 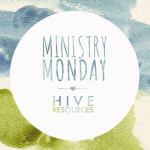 Those parts of Scripture that ask me to be selfless or sacrificial will not apply to my life. With the “I-want-to-blessed” lenses, the God of the Bible becomes my concierge, and his job is to bless me. And when things don’t go my way and my future seems uncertain, my faith is rocked to the core. I believe God to be untrustworthy or unloving. If I believe that it’s my inalienable right to be happy, then I’m going to view everything in the Bible according to that filter. I won’t be concerned with being holy, as much as I will be focused on getting my way. I will pick through the Scriptures for passages that affirm my lifestyle and choices, and I’ll throw out the parts that make me squeamish like suffering, or worse, God’s Wrath! 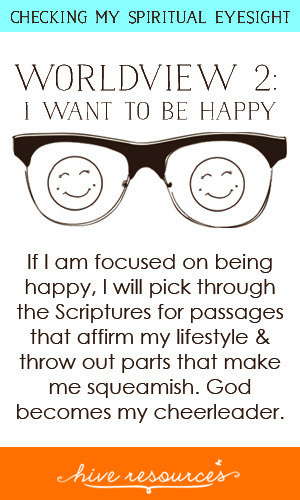 With the “I-want-to-be-happy” lenses, the God of the Bible becomes my cheerleader, and his job is to make me feel better about myself, to inspire me, to lift me up when I’m down. When I’m faced with struggles, I move onto a religious system that assuages my conscience. If I believe that my internal hurts and pains are the most important thing in my life, then I’ll view the Bible as a way to get relief. With these lenses on, I am not sinner in need of redemption, I am a broken individual in need therapy. So, I will gravitate to those parts of Scripture that center on love and exclude those parts that speak of sin. 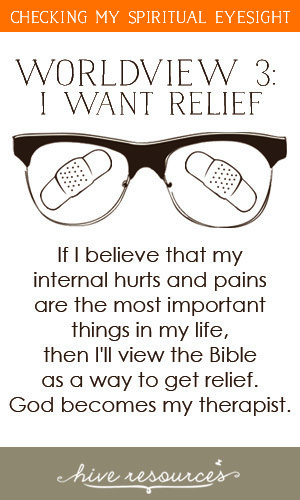 With the “I-want-relief” lenses, God becomes my therapist, and his job is to heal my internal pains and conflict. According to author and scholar David Wells, this is the most prevalent cultural context with which we approach Scripture today. In his book, God in the Whirlwind, Wells refers to this lens as “Therapeutic Deism” – it’s a filter that focuses on God’s nearness (his immanence) to the exclusion of his otherness or holiness (his transcendence). But the problem with these “God-is-my-therapist glasses” is not only is it a partial view of God, it’s dangerous! Because when we wear these lenses we become worshipers of our own comfort, our own well-being. Each of these lenses share two common elements. First, none of them do justice to the purpose and beauty of the Scriptures. Second, they all share the same problem: the wearer becomes the center of the universe. When we wear these lenses to view life, Scripture, reality, our eyes are pointed in the wrong direction. Our eyes are trained inward instead of upward and outward. That’s why we must continually check our spiritual eyesight and take off any “lenses” or worldviews we might be wearing that misrepresent that truth. Unless we get our eyesight checked out and train our eyes to adjust, we will never learn the Word, understand it, apply it, and reap its benefits and blessings from knowing its Author (transformation, peace, love, joy, fulfillment, and more!). So, we must train our eyes to see the Scriptures clearly, but how do we do that? 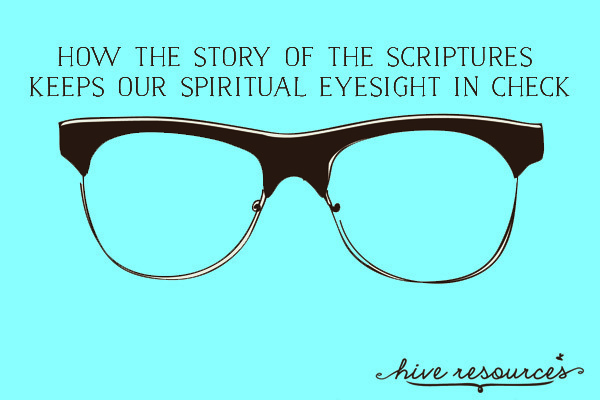 We must train our eyes to see the whole story of the Scriptures – not just parts of it. Next week, I’ll tell you just how to do that! 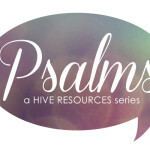 In the meantime, check out the first post in this series: 3 ways viewing the Scriptures as a story overcomes worldviews. How are you viewing Scripture? In times of trouble, which of these three worldviews is the most tempting to wear? *For more info about worldviews, see Norman Geisler and Peter Bocchino’s book, Unshakable Foundations: Contemporary Answers to Crucial Questions about the Christian Faith . Yes! I’ve seen this so much. We’ve visited other churches while traveling and have heard all these views preached. It all sounds good to our fallen ears that desire to hear what makes us feel good but that doesn’t make it true. May God’s grace help us to see clearly who he is and what he has done.